Conflicks - Revolutionary Space Battles Preview - What the Cluck? Ramming and default weapons are the core of combat, but ship abilities are what make it genuinely entertaining. Corvette-class ships have a few different wildly entertaining abilities dependent on contact with an enemy ship. 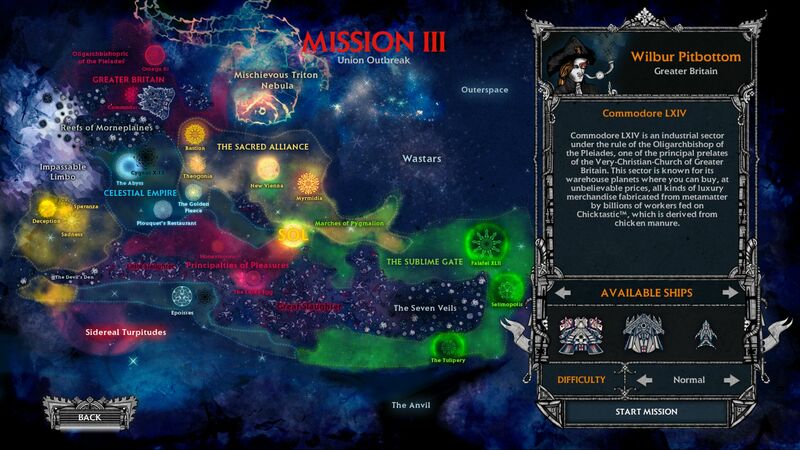 One faction lets you Charm an enemy on contact, which lets you take control and have it fight on your side. 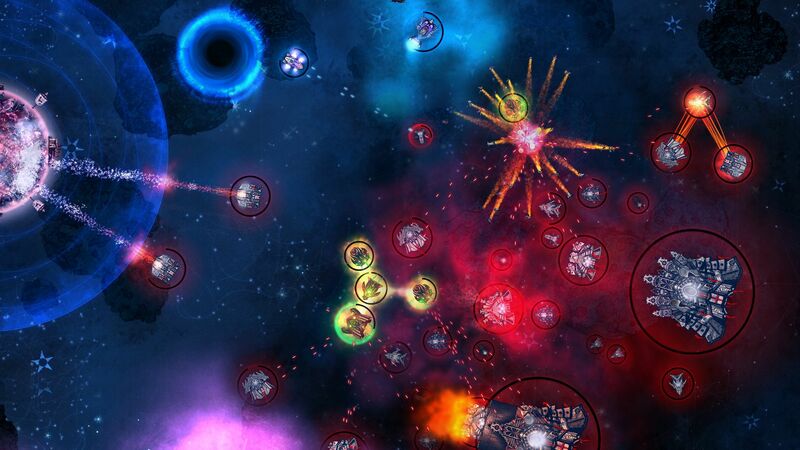 Another faction has a Teleport ability, which ports the enemy ship to a random location on contact. 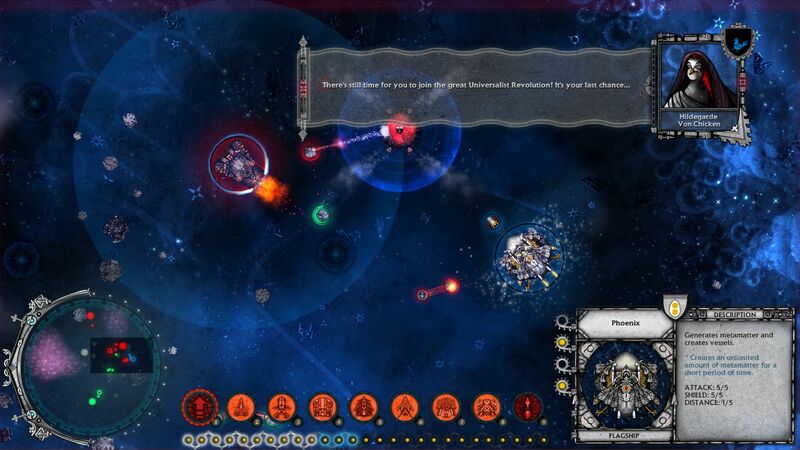 You've got Torpedo Ships that have a short-range torpedo ability, which does decent damage and knockback. I'm particularly fond of the Celestial Empire's Torpedo Ship ability, which creates 3 clones, which can all attack independently. Once you've established yourself on enough planets, your Metamatter cap will increase to the point where you'll be able to create larger classes of ships; Destroyer and Battleship. 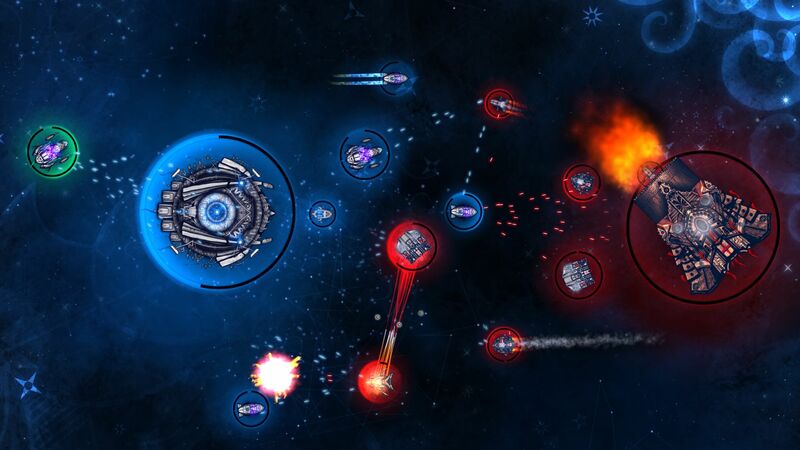 Destroyers have powerful attack abilities, like the standard Torpedo, as well as a bonus ability, such as a longer-range version of the torpedo that does bonus damage and has a greater knockback effect. 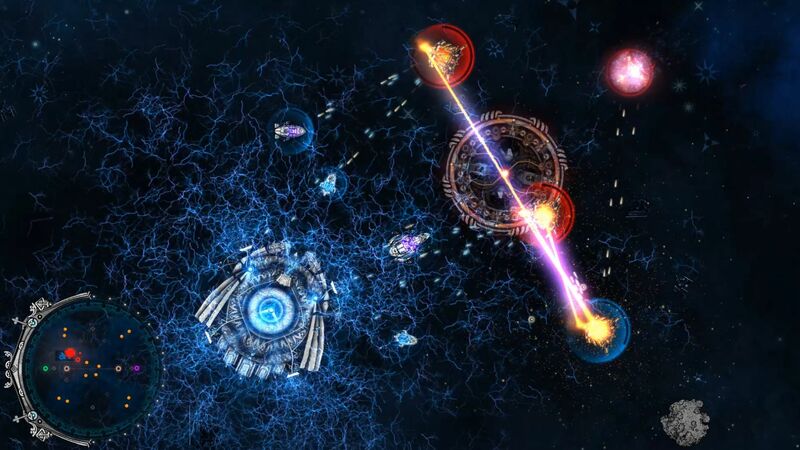 Battleships are capable of spawning scouts, Torpedo ships, and Corvettes, which makes it an incredibly powerful aggressor when it's time to take down an enemy Mothership. Just spawn scouts to ram and Torpedo ships to nuke, and you'll clean up in no time. Most ships have fairly limited range, so Frigates end up playing an important role in getting your fleet where it needs to be. 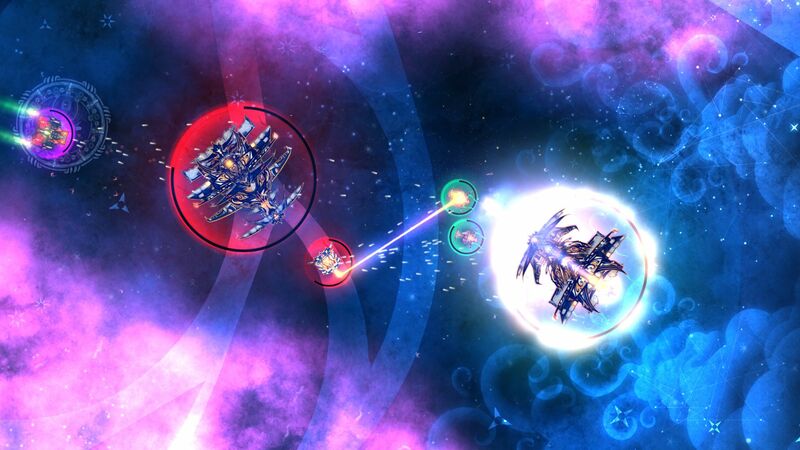 Frigates have a huge range, so they can zip across large swaths of space in a single move action. They've got the ability to tether other friendly ships, so it can bring them along for the ride. I found that Frigates are particularly useful early on, when you're establishing resource gathering, since they help get your Henships to their planets much faster, to give you a leg up on your opponents. The campaign in the preview build had 12 missions, which is fairly impressive for an early build, but a few of them were done on the same map, when time travel became a plot point. The repetitive mission was, of course, the single most aggravating mission in the game, so playing it over and over was a bit frustrating. You're required to keep another ship alive until you win, but it doesn't have any guns and frequently goes rogue, stealing control of the ship from you, and flying it directly into harm's way. It was frustrating, but it wasn't actually that bad once you figure out that just sending him to a distant corner keeps him out of danger a bit more effectively, so the fact it was the worst aspect of the campaign speaks highly of the campaign as a whole. Multiplayer is already available as well, though I've only played vs AI at this point. The MP game mode right now is basically just a resource race, where your Mothership respawns after destruction, and the winner is decided by who collects the target amount of Metamatter first. I had a lot of fun with it, but I'm definitely hoping there will be more mode options available at launch. If you've played StarCraft or the like, you'll be right at home with Conflicks, even though some of the mechanics are a bit weird by comparison. It's dramatically slower paced than most RTS games, and will not only be great fun for veteran players but will make the genre as a whole a bit more accessible to newcomers, since your fate isn't always decided in the first 60 seconds of a match. 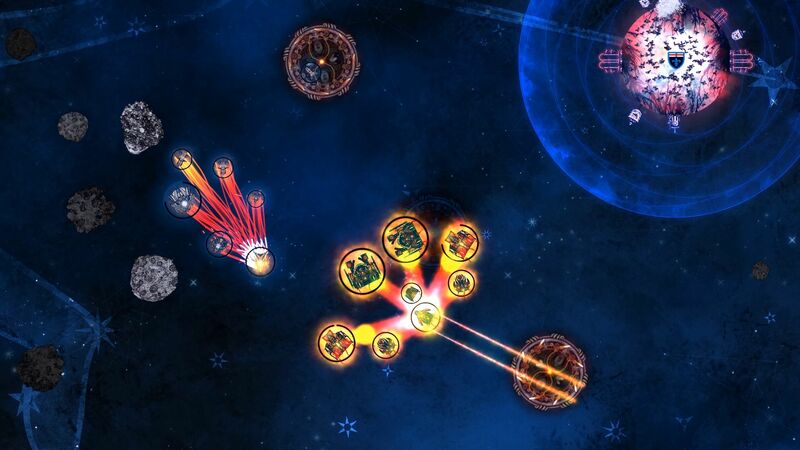 Conflicks: Revolutionary Space Battles is slated for a Fall 2015 release on Steam.